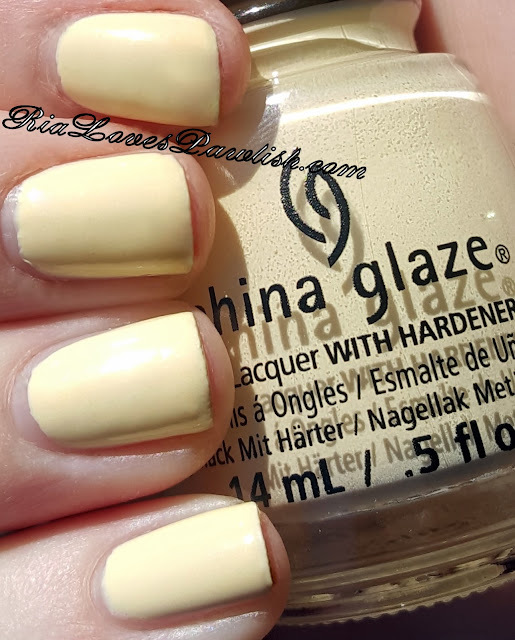 today's China Glaze House of Colour polish is Girls Just Wanna Have Sun (it's a press sample, kindly provided to me for review). it's an interesting color, i don't think i have anything exactly like it! Girls Just Wanna Have Sun is an ultra light strongly yellow-toned cream color in a creme finish. a bit lighter than vanilla pudding! application is a little difficult as many yellows are. it's quite patchy on the first coat, but working with in the second coat helps out a lot, and it is fully opaque in two coats. definitely use topcoat as that will help even out any lingering patchiness! two coats Girls Just Wanna Have Sun, finished off with one coat Salon Perfect Crystal Clear Top Coat.